This adorable loft is in the ideal location within walking distance to downtown Paso Robles restaurants, wineries, and boutiques! This home features 1 bedroom with a queen size bed and one full bathroom. Enjoy preparing dinner in the fully-stocked kitchen complete with a refrigerator, dishwasher, microwave, drip coffee maker, and blender. This house has everything you need for a perfect getaway! This loft is the upper floor of another vacation rental. Please be courteous of downstairs guests. You can rent one or both units. This home is easily accessible to Hwy 101, only 4 blocks away from the downtown square and only 5 minutes away from Templeton. 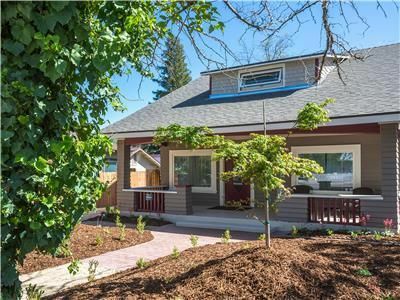 This home is within walking distance to many downtown tasting rooms: LXV Wine Tasting Room, Tudor Wines, Derby Wine Estates Tasting Room, Cypher Winery, Copia Vineyards, and Pianetta Winery. Or feel free to spread your wings and explore the other 200+ wineries that Paso wine country has to offer! Indulge yourself at one of the many restaurants in downtown Templeton or Paso Robles. From farm-to-table concepts to wine pairing with meals, you are sure to have a fine dining experience!